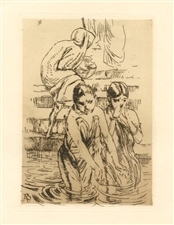 Albert Besnard original etching "Etude"
Medium: original etching. From the rare 1897 portfolio "Art et Nature" by Leon Roger-Miles, published in Paris by Boudet in an edition of 525. A beautiful impression on Marais wove paper, the plate size is 7 x 5 inches (180 x 125 mm). Not signed. Albert Besnard original etching "Femme nue a sa toilette"
Medium: original etching. Catalogue reference: Delteil 166. Printed in Paris and published in 1911 by Gazette des Beaux Arts. Plate size: 5 1/2 x 4 1/4 inches (140 x 109 mm). A rich, dark impression on watermarked Porcabeuf laid paper. Not signed. Condition: there is a bit of foxing in the margin near the edge of the sheet, well away from the etched image. Albert Besnard etching "Portrait de Mme R. J." 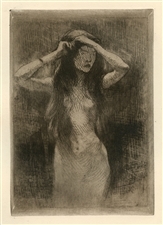 Medium: etching (etched by Coppier after Albert Besnard). This impression on wove paper was printed in 1903 and published in Paris by the Gazette des Beaux-Arts. The image measures 8 x 6 inches (205 x 152 mm). Signed in the plate, not hand-signed. Condition: there is foxing in the margin and no margin on the left side.